Lumber Liquidators is facing the possibility of criminal charges by U.S. authorities over its imports of wood flooring. Lumber Liquidators (LL) disclosed on Wednesday that the Justice Department is seeking criminal charges against the company for violations under the Lacy Act, which bars imports of illegally logged wood, among other things. The latest news comes amid allegations that some of Lumber Liquidator's wood flooring may contain toxic chemicals. The company came under fire in a March 1 "60 Minutes" report that claimed laminated flooring imported from China contained high levels of formaldehyde, a carcinogen. Shortly after the show aired, the U.S. Consumer Product Safety Commission said it was investigating the flooring. The agency said if it found a safety problem it would ask the company to recall the flooring. U.S.-made flooring sold by the company was found to be safe, according to the CBS report. But hundreds of thousands of homes nationwide had already installed the Chinese-made flooring. Federal authorities had raided the company's offices in Virginia in 2013, acting on search warrants for information about imports of certain wood flooring products. 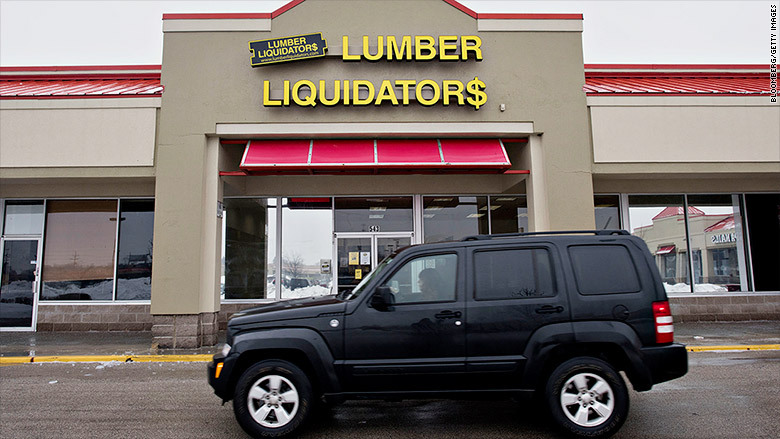 The controversy is taking a toll on Lumber Liquidator's bottom line. Lumber Liquidators said Wednesday that net sales plunged nearly 13% in March from a year ago due to "unfavorable allegations surrounding the product quality of the company's laminates sourced from China." CEO Robert Lynch told analysts in a conference call that the company has stopped adding inventory of laminate flooring made in China "in response to consumer demand." At the same time, it is increasing supplies of wood laminate from Europe and North America, he added. Meanwhile, more than 100 class action lawsuits over floors made in China have been filed against Lumber Liquidators since March, according to the regulatory filing. "Costs related to legal and professional fees and a regulatory accrual were significant in the first quarter," said Lynch. He said the company has set aside $10 million in the first quarter for the Justice Department investigation. All told, Lumber Liquidators is holding $15.5 million in reserve to cover costs associated with the problem. The company also said it increased a credit facility with Bank of America (BAC) to $100 million, up from $50 million, which it plans to use for capital expenditures and other costs.